A decade ago new accounting rules directed state and local governments to begin calculating and reporting debt owed for health care promised retirees, which for state workers turned out to be more than the debt owed for pensions. In a new step to expose hidden debt, the Governmental Accounting Standards Board last week proposed that retiree health care debt or “unfunded liability” be reported on the face of government financial statements, not buried inside. Most government retiree health care is pay-as-you go, covering part or all of annual insurance premiums. No money is set aside, as in a pension, to invest and yield earnings, lowering long-term costs and cutting debt passed to future generations. State Controller John Chiang, who in 2007 issued the first estimate of state worker retiree health care debt, said in a new report last March the unfunded liability for pay-as-you-go state worker retiree health care is $64.6 billion. 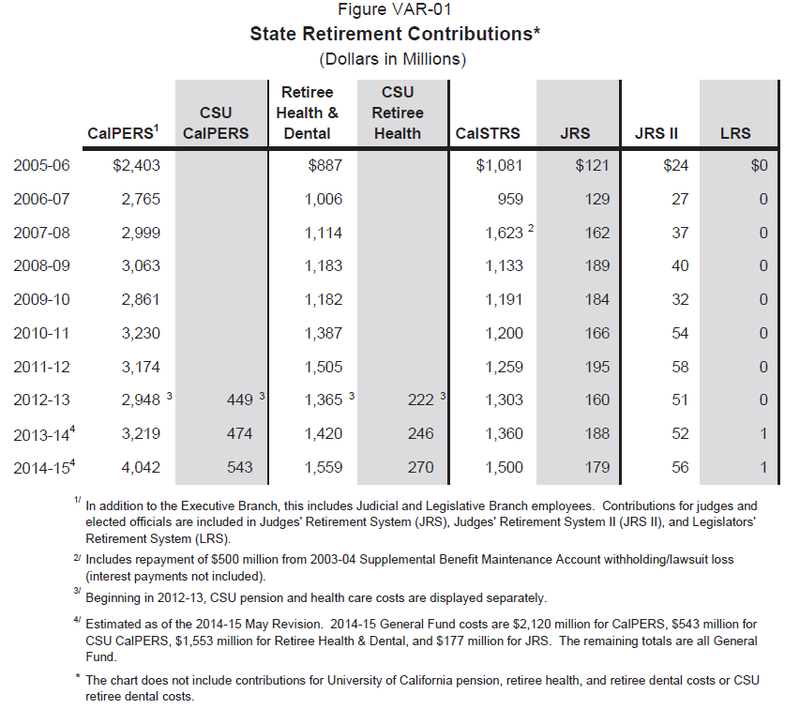 In contrast, the unfunded liability for state worker pensions is $49.9 billion as of last June 30, a CalPERS valuation said in April. State worker pensions have a low funding level, 66.1 percent of the projected assets needed for full funding. The state pays 100 percent of the premium of the retiree (the average of several large plans) and 90 percent of dependent premiums. For active workers, the state usually pays 80 or 85 percent of the worker premium and 80 percent of dependent premiums. The governor mentioned retiree health care at a news conference last month while proposing a revised state budget plan that includes a long-term funding solution for the troubled California State Teachers Retirement System. The chart shows retiree health care has been the fastest-growing state retiree cost, doubling in a decade. Nearly all of the $1.8 billion retiree health payment next fiscal year comes from a $108 billion general fund that pays for schools and other programs. An example of the disregard for long-term retirement debt that the accounting board is trying to change: Legislation in the early 1990s created an investment fund for California state worker retiree health care, but lawmakers never put money in the fund. The rule change in 2004 telling governments to phase in the calculation and reporting of retiree health care debt was followed by the controller’s initial report on state worker debt three years later. After a year of hearings and study, the top recommendation of the governor’s Public Employee Post-Employment Benefits Commission in 2008 was “prefunding” retiree health care, setting aside money to invest and help pay for future obligations. “The best way to ensure that government promises are kept is to provide prefunding for these benefits,” the chairman, Gerald Parsky, said in the opening message of the commission report. For local governments choosing to prefund retiree health care, the California Public Employees Retirement System in 2007 established an investment fund, which had 375 employers last August with total investments worth $3.6 billion last week. The CalPERS retiree health care fund (the California Employers Retiree Benefit Trust) lets employers choose among three conservative investment strategies with varying risk and returns. The median 20-year return expected for the three strategies ranges from 4.61 percent a year to 3.39 percent. That’s roughly similar to recent yields on 20-year municipal bonds used in the new GASB proposal to report retiree health care debt. An employer’s report could use the expected return on a retiree health care investment fund to pay long-term debt. But if that falls short, or there is no investment fund, the remaining debt would be reported as if paid with a 20-year municipal bond. A “crossover” from the expected investment return to a high-quality municipal bond, the presumed cost of borrowing, may not be much of a change for employers in the CalPERS retiree health care fund because of little difference in the yields. But a similar GASB reporting rule is taking effect for pension funds that critics say have an overly optimistic expected return on their investments, 7.5 percent a year for CalPERS and the California State Teachers Retirement System. Closer alignment with the new accounting rule was one of the goals mentioned when CalPERS adopted a new actuarial method for pensions last year, aimed at reaching full funding in 30 years rather than decades later under the old method. Now CalPERS expects little if any “crossover” to a lower-yielding bond rate under the new pension rule, and therefore little change in its reported unfunded liability. But without a costly funding solution, the CalSTRS investment fund is expected to be depleted in about 30 years. The CalSTRS board was told last September that under the new rules a $71 billion unfunded liability could soar to a $166.9 billion “net pension liability,” an estimate since outdated by another year of investment returns and other factors. Whether big new pension debt would be reported by school districts next year, possibly lowering credit ratings and increasing borrowing costs, is not clear. Legislation enacting a CalSTRS funding solution this year would avoid much of the problem. Part of the reason that retiree health care has not been prefunded like pensions may be uncertainty about whether the health benefit, unlike pensions, can be cut or even eliminated. Under a series of court decisions dating back to at least 1955, pensions offered on the date of hire are widely regarded as a “vested” right, protected by contract law, that can only be cut if offset by a comparable new benefit. A benchmark ruling on retiree health care by the state Supreme Court in 2011 said a contract with vested rights “can be implied under certain circumstances from a county ordinance or resolution” if an intent to do so can be shown by evidence. Since then there have been several retiree health court rulings, one in Los Angeles finding a contract and others in San Diego and Orange and Sacramento counties allowing cuts. Last month the state Supreme Court declined to hear a San Diego decision appeal. A GASB fact sheet last week, using the governmental term for retiree health care (Other Post-Employment Benefits), broadly defined liability as a social, legal or moral requirement. “The possibility that a government could change or end the OPEB it has promised in the future does not change the fact that, as of the date of the financial statements, it had a present obligation to fulfill its promise to provide OPEB,” said the fact sheet. GASB plans to post an “exposure draft” of the new retiree health rules on its website by the middle of this month, seeking comment from stakeholders by Aug. 29. Public hearings are scheduled Sept. 10, 11 and 12 at locations not yet announced. This entry was posted on June 2, 2014 at 7:59 am and is filed under CalPERS, CalSTRS, GASB, Retiree health. You can follow any responses to this entry through the RSS 2.0 feed. You can skip to the end and leave a response. Pinging is currently not allowed. And of course, It’s the Taxpayers that they likely want to fund 90+% of it. With it being the RARE Private Sector worker that gets ANY employer-provided retiree healthcare today, why should Taxpayers fund ANY (yes ANY) such benefits for PUBLIC Sector workers …. let alone the “Cadillac” Plans in place today ? Taxpayers ………… REFUSE to fund this any further ! Yes Tough Love, we do need to refuse. And the way to do that is to vote Tim Donnelly for Governor on June 3rd. This is a Democratic problem in need of a Democratic solution. This is an excellent discussion topic. With the Affordable Care Act taking effect, we may see the second time in almost 20 years that health premiums did not increase by double to quintuple the rate of inflation. Health premiums have been out of control due to a lack of market competition and a Federal Law signed by Ronald Reagan, EMTALA. Pile on Medicare Part D and you have a recipe for requiring medical treatment and medications without a tax to pay for any of it. Can you now understand why illegals flow into this country for jobs and medical care. I just don’t get it…I know, Ronnie legalized many of them. Free lunch anyone? So, health premiums have increased at double digits, taxpayer obligations have increased and finally, everyone will pay something to the pot that everyone will need at some point in life. Oh the dreaded Socialism. The increase in my health premium this last year was a whopping 4%! Instead of the usual 8-12% I have been accustomed too. What is funny is this article states this is “hidden” while the accounting rules to make it known is 10 years old? Was it never reported before now? Not really “hidden” is it. But that isn’t a good hook for a story. Seems like a great argument for the Affordable Care Act! Way to goBama! Toughlove, you should have worked for Aerojet, Hughes, McDonald Douglas, Boeing, and number of defense industry contractors that all offered paid health care and little or no out of pocket cost for medicines. I have a family member who paid $12 a month for all his medications and those of his wife until they transitioned to Medicare. Poor planning on your part. And that is only the cost for state workers. What about all the cities, county’s, and special districts? Are we talking 130 billion combined that is owed to current/past workers? Is it 200 Billion? Jerry Brown was Mayor of Oakland and Oakland is up to their eyeballs in pension/retiree healthcare debt – and will soon be filing bankruptcy (when, not if, is the only question). I hope JB has a better plan for the collective state/county/city/special district plans than he did while running Oakland. If not, he will go down as the Governor that side-stepped the elephant in the room in order to play with his train. Billie, I’m talking about ongoing RETIREE Healthcare subsidies to Public Sector workers. Even the big companies have all but ended such subsidies. There is ZERO reason for Taxpayers to continue to fund it for PUBLIC Sector workers. At age 65 everyone is eligible for Medicare. The retiree health care, part of the deferred compensation of the employee, is contracted for during the work life of the employee. If you think working 20 years to achieve a vested right of the full benefit is not long enough, you can take that up with your representative. If you don’t like you Water Board, City, County offering 5 or 10 year vested right, you can take that up with them. They have boards, councils, supervisors etc. If you don’t like Congress getting a Platinum all expenses paid health care plan, vote for the Congress person you want to have that plan because they aren’t about to vote themselves a Gold or Silver plan.